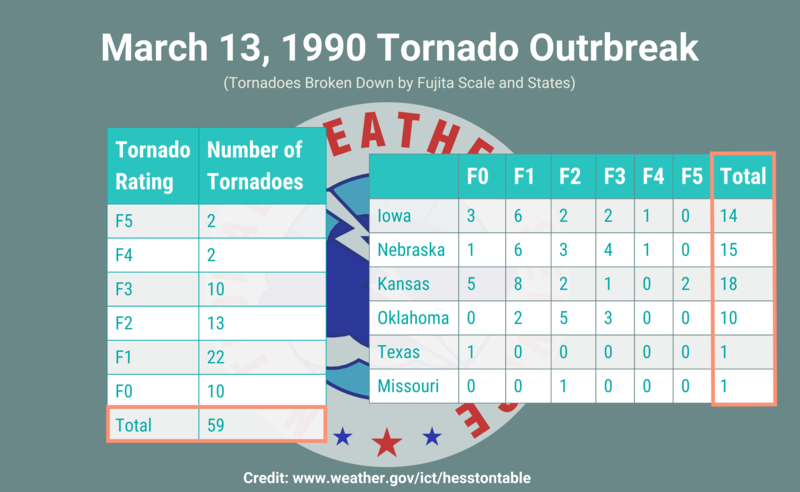 March 13, 1990: A devastating tornado outbreak brought a total of 59 confirmed tornadoes across Oklahoma, Kansas, Nebraska, and Iowa (See Figure 1 Below). The tornado outbreak brought two F5 tornadoes and two F4 tornadoes across the central United States (See Table Below). 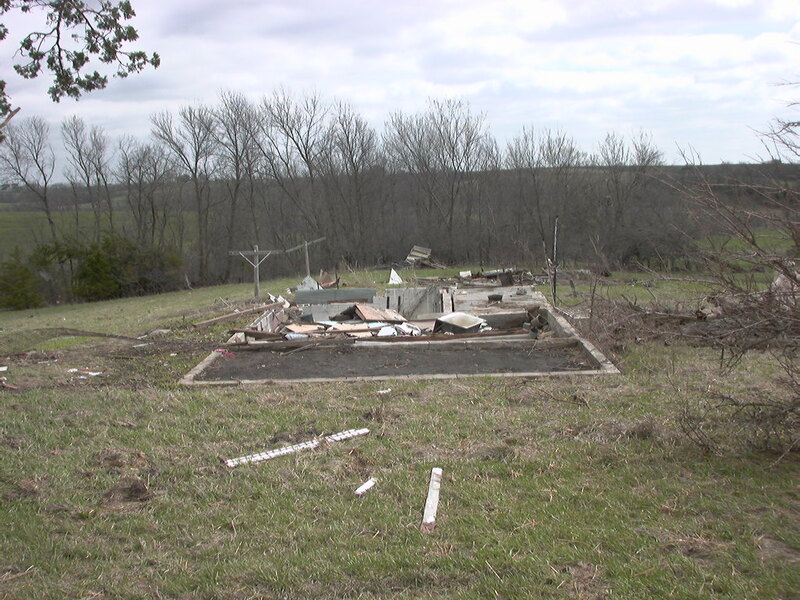 One of the F5 tornadoes was the historic Hesston, Kansas tornado. Across Iowa, multiple severe thunderstorms swept across the state and produced at least 14 tornadoes, including an F4 which struck areas around Prairieburg and Worthington, Iowa and an F2 which injured 15 people and produced 6 million dollars in damage in and around Ankeny, Iowa. Hail reports ranged up to golf ball size near Elvira and wind gusts in excess of 75 mph were reported around Little Sioux and Logan. This was part of a wild stretch of weather in early to mid March of 1990 that saw a significant ice storm followed by several severe weather and tornado outbreaks then a big snow storm, all in a nine day stretch! 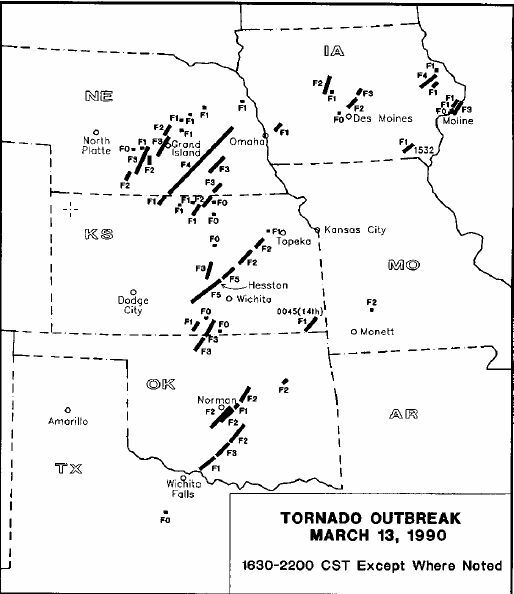 Figure 1: March 13, 1990 Tornado Outbreak. 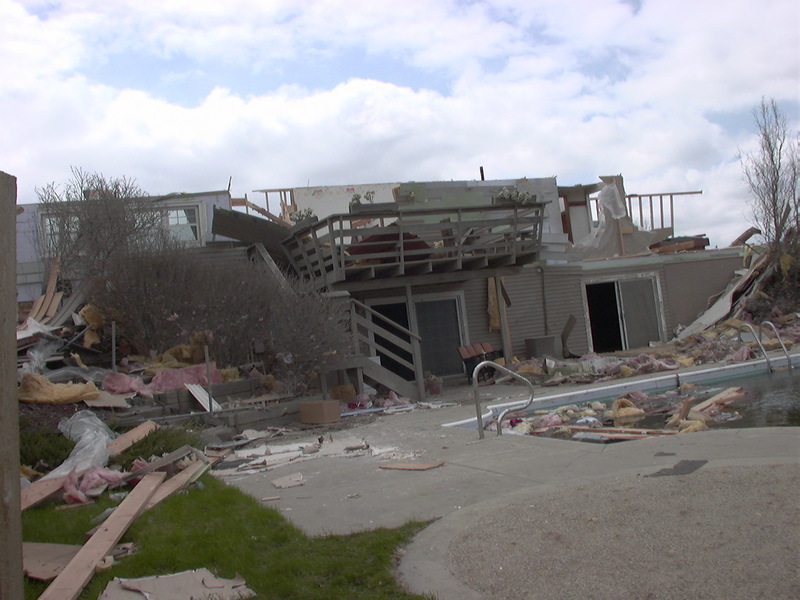 On May 11, 2000, severe thunderstorms produced large hail and at least seven tornadoes across northeastern Iowa including one that killed one person and injured 25 others as it produced F3 damage near Dunkerton, Iowa. This would be affecting some of the same areas that would be struck by the EF5 Parkersburg tornado eight years later. The largest reported hail stones were the size of baseballs, falling near Dorchester in Allamakee County. 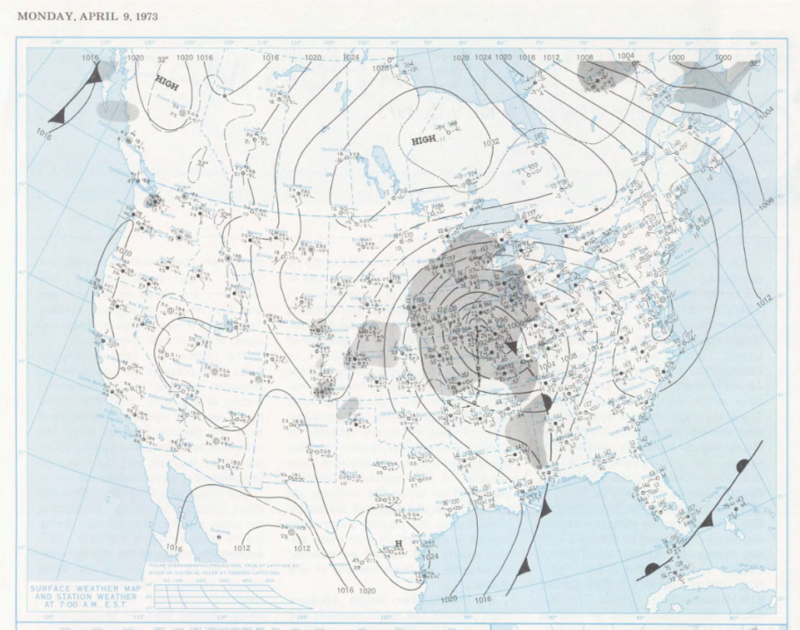 On March 14-16, 1959, a major winter storm struck Iowa as a potent low pressure center moved east northeast out of Kansas into central Illinois resulting in 6 deaths and 1 injury. Precipitation began in southern Iowa as rain on the morning of the 14th then started to switch to a heavy wet snow by afternoon. The heaviest snowfall occurred overnight on the 14th-15th, with 4 inches or more falling in a wide swath from southwest to northeast across the state and some areas within that band receiving 8 to 10 inches. The highest reported storm total snowfall accumulations included 12.5 inches at New Hampton, 12.0 inches at Cresco, and 10.0 inches at Clarion, Fayette, and Fort Dodge. Winds gusting to as high as 60 mph caused severe blowing and drifting of the snow, commonly producing drifts up to 10 feet deep. There were even reports in northeastern Iowa with drifts as deep as 15 feet! Across about the southern half of the state, the heavy snow remained very wet and froze to all surfaces. As a result, thousands of trees, utility poles and lines were snapped or heavily damaged. Even after the heavy snow ended on the 15th, frozen surfaces and high winds continued to make travel impossible across most of the state. In fact, Des Moines and Dubuque authorities prohibited any travel to or from their cities. Also in Des Moines, there were 5,000 basketball fans attending the girls state tournament that spent the night in the Veterans Memorial Stadium building. 1991: A major winter storm pounded the upper Midwest from October 30th into November 2nd with some of the most severe effects occurring on Halloween. Snow moved into southern Iowa on the afternoon of the 30th and changed to mixed precipitation and ice on the morning of the 31st and continuing into late afternoon on November 1st. Total ice accumulations ranged from 1 to 2 inches from southwest into north central Iowa and 2 to 3 inches across southern and southeast Minnesota. In northwest Iowa, the precipitation fell as all snow. Total snow accumulations of 8 inches or more blanketed the area with 15.0 inches falling at Estherville. 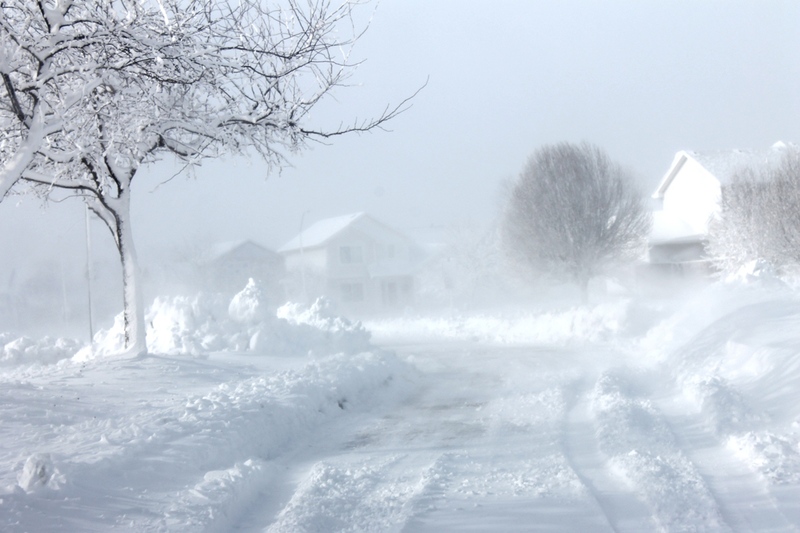 Stong winds produced blizzard conditions into November 2nd. The damage and hazardous travel conditions were so severe and extensive that 52 of the 99 counties in Iowa were declared disaster areas. Highways and interstates were closed across most of the state and Halloween festivities were cancelled at many locations. As the storm system moved further northeast it dumped 36.9 inches of snow at Duluth which, at the time, was the largest storm total snowfall accumulation on record in Minnesota until it was surpassed in 1994. 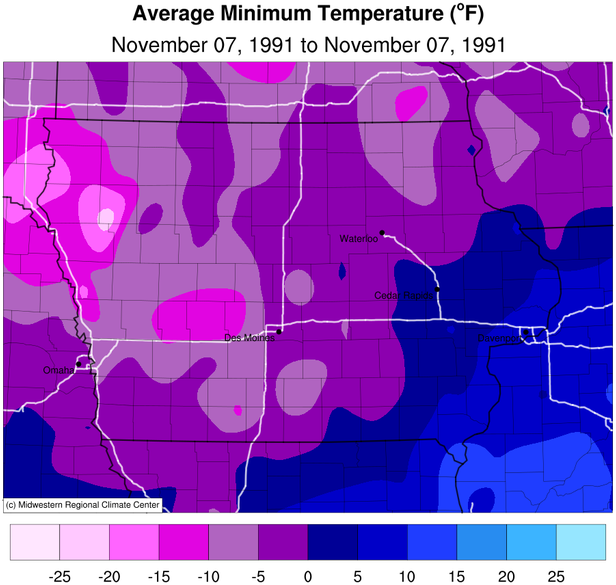 Extreme cold followed the crippling Halloween Storm from November 4-8, 1991. With the fresh snow pack in place, on November 4th nearly every reporting station in the state fell into the single digits and remarkably some western stations reported their earliest subzero temperatures on record, including Sioux City where the low was -3°F. Des Moines and Waterloo both established daily records with a low of 4°F. The lowest temperatures reported on the morning of the 4th included -7°F at Sioux Rapids, -9°F at Hawarden, -10°F at Sheldon, and -11°F at Cherokee. Amazingly, even colder weather would settle across Iowa a few days later with nearly the entire state falling below zero on the mornings of November 7th and 8th. On the 7th many stations set daily record lows and at numerous locations this is the earliest date on record on which the temperature has fallen below zero, including at Des Moines where the low was -3°F. The lowest reported temperatures in Iowa that morning included -12°F at Audubon, -13°F at Perry, -14°F at Le Mars, -15°F at Sheldon, -16°F at Guthrie Center, -17°F at Cherokee, and -19°F at Hawarden. On the morning of the 8th reported low temperatures included -2°F at Burlington, -8°F at Bedford and Grinnell, -11°F at Sac City, -12°F at Atlantic and Le Mars, -13°F at Cherokee and Perry, and -14°F at Guthrie Center. Regional map of the the Halloween 1991 winter storm. 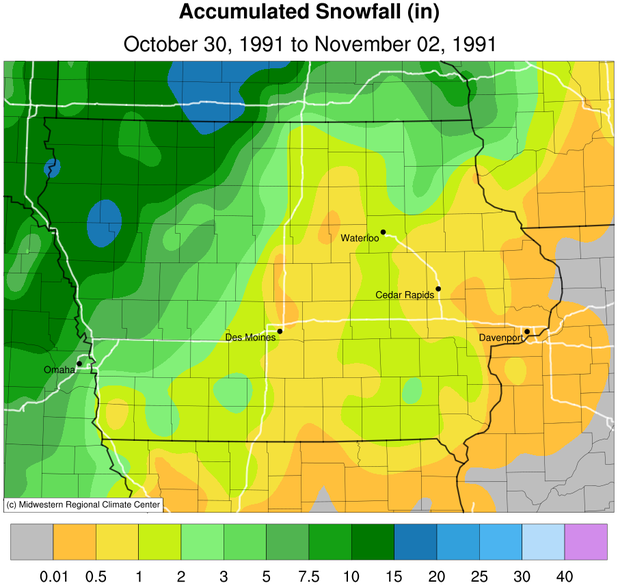 Accumulated Snowfall across Iowa from October 30 to November 2, 1991. The bulk of the precipitation fell on Halloween 1991 much of the eastern two-thirds of the state receiving freezing rain. Regional map of the bitter cold temperatures on November 7, 1991. Bitter cold temperatures followed the Halloween Winter Storm with the coldest day occurring on November 7, 1991. A major winter storm moved into western Iowa just before midnight on October 25th and spread across about the southeastern two thirds of the state on the 26th. Two bands of heavy snow developed, one extending from Council Bluffs northeast through Boone and the other extending from northern Ringgold County northeast to around Cedar Rapids. The heaviest snowfall accumulations included 11.3 inches at Knoxville and an amazing 13.0 inches southwest of Mineola in Pottawattamie County. Electricity was lost to tens of thousands of homes and businesses in central and southern Iowa as snow laden trees fell onto power lines. 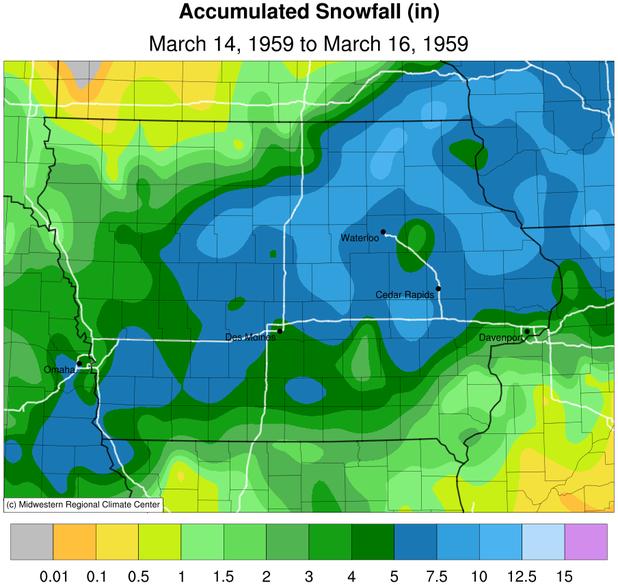 This was the most significant heavy snow so early in the season in Iowa since the storm of October 16-17, 1898. On the morning of the 27th temperatures plummeted, with the aid of the fresh snow pack on the ground, bottoming out at 9 F at Atlantic and Guthrie Center which was the coldest Iowa temperature recorded so early in the season since 1972. 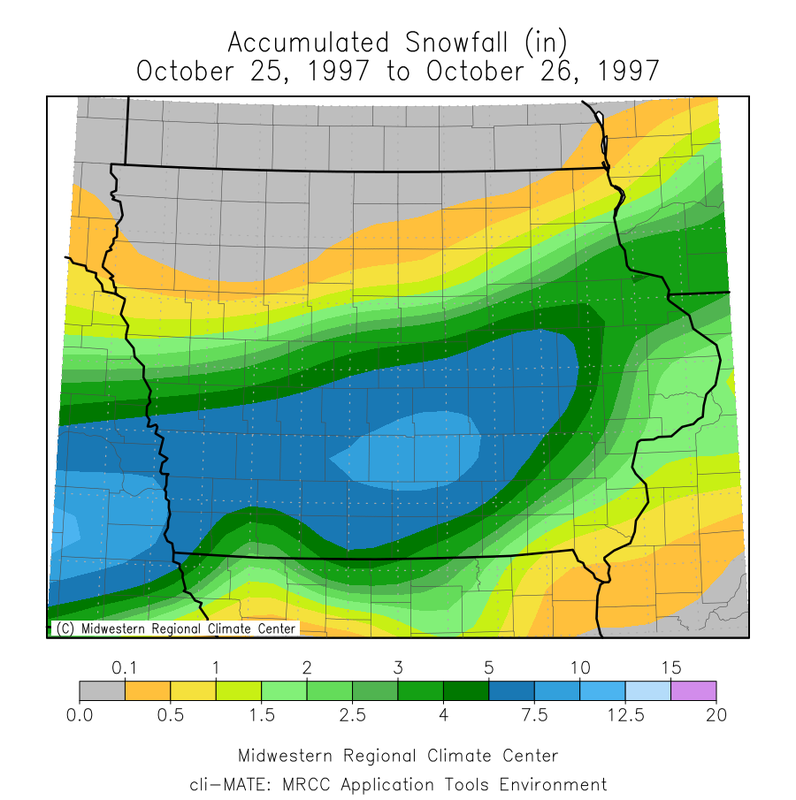 While this system produced nearly all of the snow that fell during the month of October 1997, it was still enough to make it the third-snowiest October on record in Iowa only behind those of 1898 and 1925. 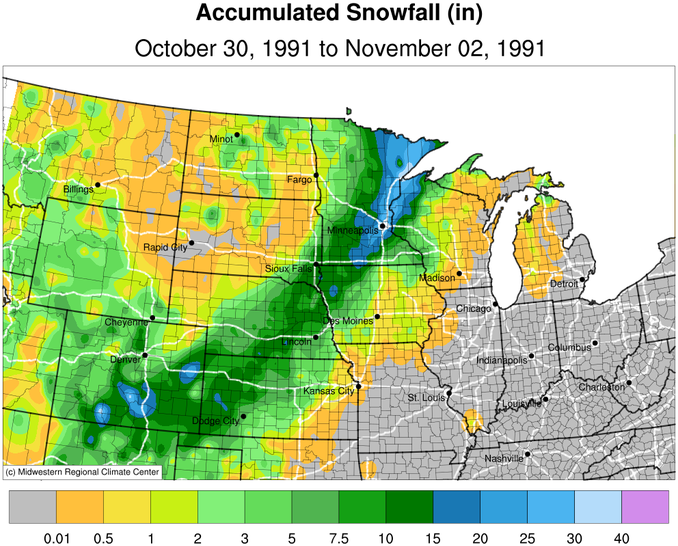 Total snowfall accumulation from a major winter storm that occurred on October 25-26, 1997. 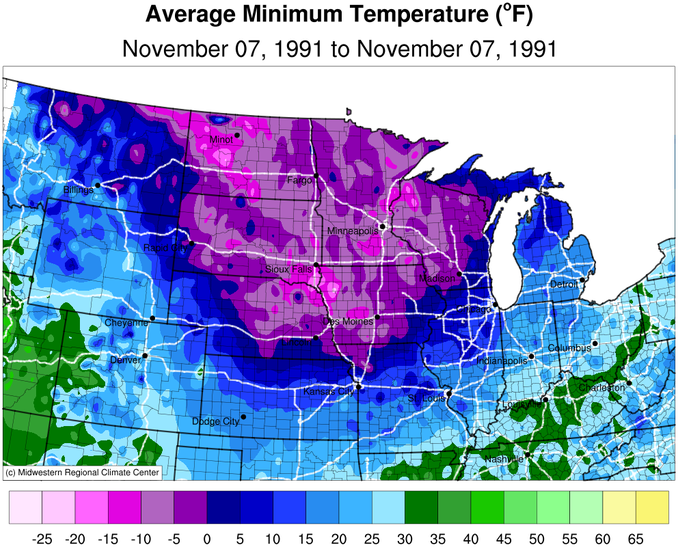 Average Minimum Temperature on the morning of October 27, 1997 after a major winter storm. Iowa certainly has had its extreme weather. May is no exception and today (May 6) has proven that Iowa can experience many different types of weather no matter the season. From snow to tornadoes to extreme heat or bitter cold and not to forget flooding. Below are 6 years of the most extreme weather across Iowa that has occurred on May 6. 1885: A late spring cold spell produced frost and flurries across Iowa from May 6-9, 1885. On the morning of the 6th it was reported that ice half an inch thick formed on standing water in Muscatine County. Flurries were reported at Sibley, St. Ansgar, and Waukon that morning and at other stations across northern Iowa on the following two days. The cold spell resulted in widespread damage to garden plants, orchards, and other vegetation across the state. 1934: One of the hottest summers on record in Iowa began in earnest as the temperature reached 100 F at Sioux City where this remains the earliest date of triple digit heat on record. This was only the first of a remarkable 11 days that month on which a 100 F or higher temperature was recorded somewhere in Iowa. Other reported high temperatures included 100 F at Alton, 99 F at Le Mars, Storm Lake, and Waterloo, 98 F at Algona and Grinnell, and 97 F at Atlantic, Fayette, and Washington. At Des Moines the month would finish as the warmest May on record with an average temperature of 71.1 F. A couple figures in the slideshow below shows the maximum temperatures and their departure from normal. 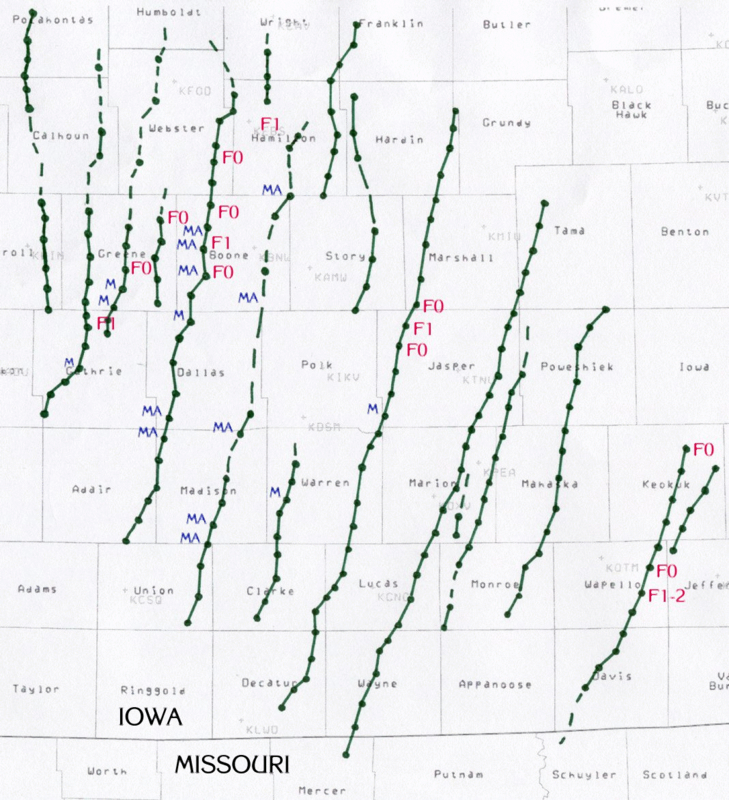 1971: Severe weather struck southwestern Iowa for the second consecutive day. After an F3 tornado on the 5th injured 12 people in Taylor County as it passed through the town of Conway, a severe hail storm on the 6th dropped stones 2 inches in diameter in Mills County for such duration that they drifted 2 to 3 feet deep in the ditches and gullies around Glenwood. 1983: A tornado touched down briefly in Pleasant Hill on the eastern edge of Des Moines, producing F2 damage as it destroyed 11 homes and damaged about two dozen more on a path only 8 to 10 blocks long and 50 to 75 yards wide. Several other tornadoes touched down across central and southwestern Iowa that evening but produced only minor damage with no injuries. 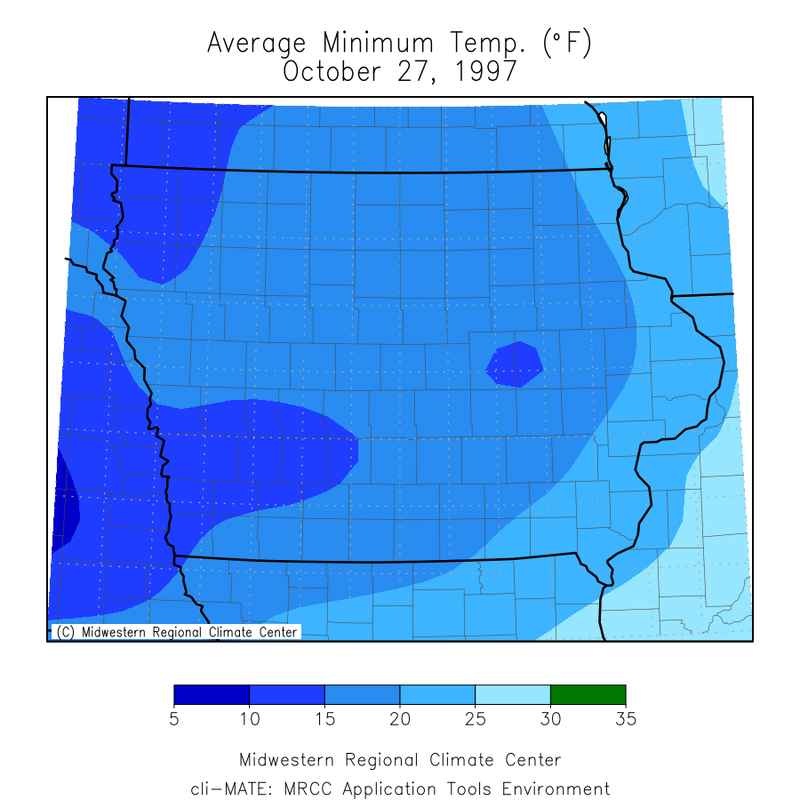 1989: Unseasonably cold air settled across Iowa for the first week or two of May. The coldest temperatures were reached on the 6th when flurries were reported at most locations in the state and Hampton measured a tenth of an inch of snow. Temperatures bottomed out in the 20s at most stations north of I-80 and in the low to mid 30s to the south with the lowest readings including 26 F at Allison, Fayette, and Oelwein, 25 F at nine stations including Decorah, Forest City, and Hampton, 24 F at Charles City and Colo, and 23 F at Cresco. The low temperatures across Iowa were 12 to 18 degrees below normal! See the slideshow below for a map of where the coldest temperatures were located on May 6, 1989. On April 10-11, 2001, a significant severe weather outbreak produced 28 tornadoes across Iowa which was part of a region wide 2-day tornado outbreak that spawned 79 tornadoes across Nebraska, Iowa, Kansas, Missouri, Oklahoma, and Texas. The 28 tornadoes in Iowa became an all-time state record for tornadoes in a single day. The majority of these tornadoes were toward the weaker end of the Fujita scale. However, an F2 struck Agency, Iowa in Wapello County that caused two deaths and three injuries. Another tornado, a long-lived tornado, tracked from northern Missouri to Madison County and caused extensive damage in Ringgold County. In addition to the widespread tornadoes, large hail was also reported ranging up to golf ball size at Parkersburg and there were scattered reports of 70 to 85 mph wind gusts with the worst straight-line wind damage in Black Hawk and Franklin counties. A very strong low pressure system moved from central Kansas into southeast Nebraska on April 11, 2001. A warm front extended east along the Missouri/Iowa border during the late morning and surged northward throughout the afternoon (see the 3 hand drawn surface analysis below). A dryline oriented northwest-southeast moved from southwest Iowa into central to south-central Iowa in the afternoon. Storms erupted along this dryline in the afternoon, but there were also storms that focused along the warm front. As you can see from Figure 1 below, the radar operator had a very busy day identifying the rotation within each storm that were rapidly moved north-northeast through the afternoon hours. There were 12 tornadoes that occurred within the NWS Des Moines county warning area. 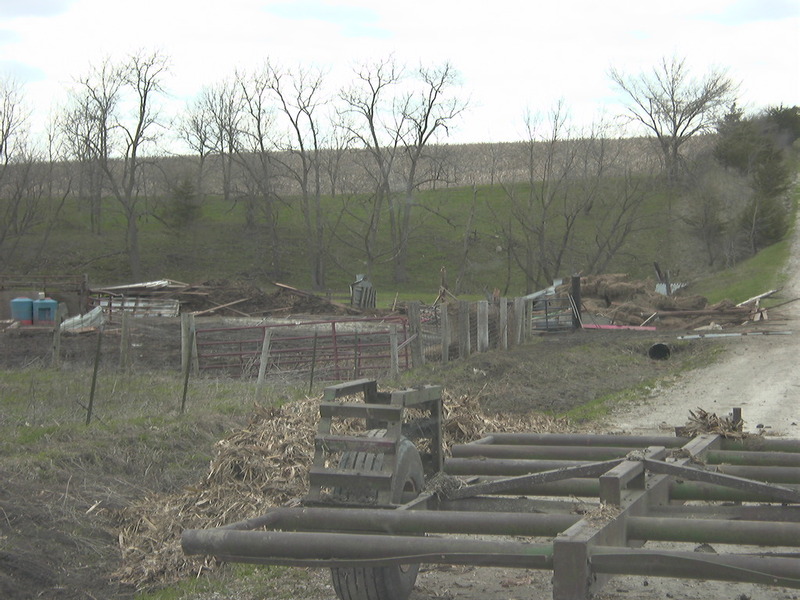 F1 damage to a barn three miles northwest of Murray, Iowa along the Union and Clarke county line. Three cows were killed along with multiple large trees down. NWS Des Moines Survey. F3 damage to an apparently well built home. 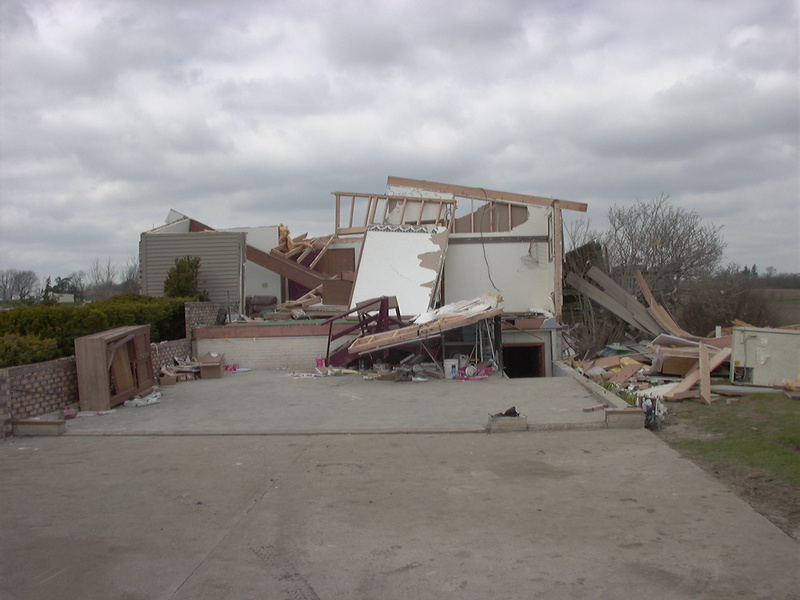 The destruction included the roof being completely gone and several interior and exterior walls destroyed. Location of the home was along highway 2 one mile east of Mount Ayr, Iowa. NWS Des Moines survey. F2 damage along J55 three miles north of the Missouri border, or seven miles south of Mounty Ayr, Iowa. A partial underground home severely damaged. Roof completely off and destroyed. Interior walls and main wall facing south remained intact limiting damage to F2. NWS Des Moines survey. F2 damage along P38 1.5 miles north of the Missouri border. Weak structure, or old house, that was completely destroyed. This was similar to a mobile home being destroyed. NWS Des Moines survey. 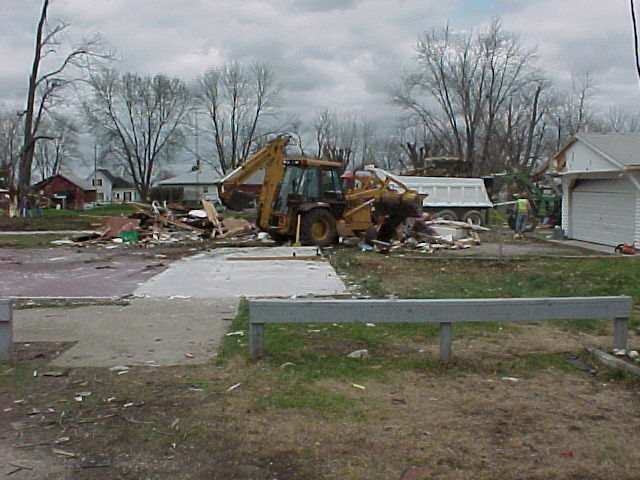 A damaged home in Agency, Iowa. Reference: Karl A. Jungbluth; “The Tornado Warning Process During a Fast-Moving Low-Topped Event: 11 April 2011 in Iowa. 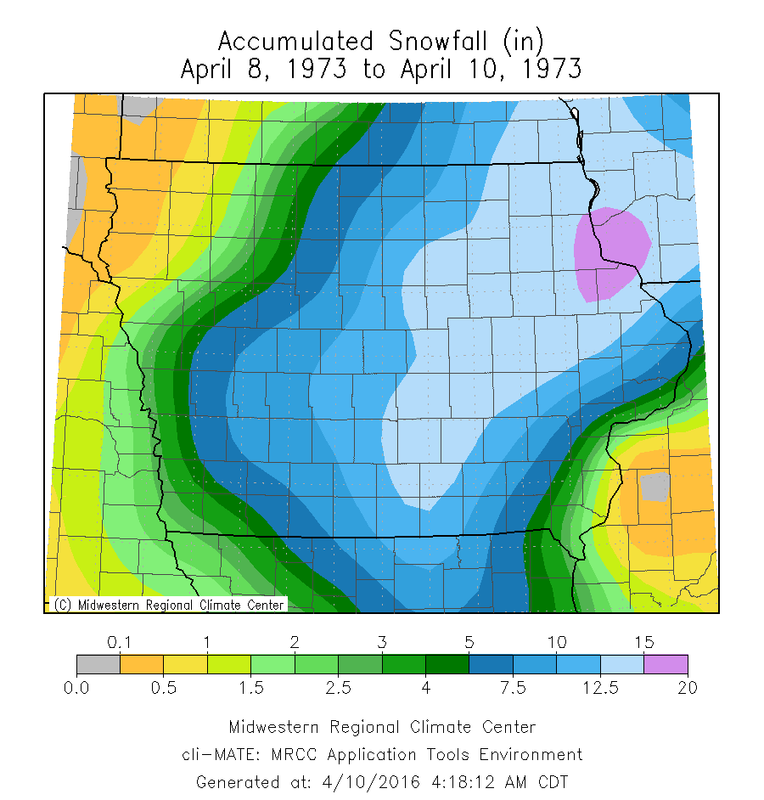 Snowfall totals from April 8-10, 1973 across Iowa. The highest total was 20.3 inches in Belle Plaine, Iowa (Benton County). Des Moines Totaled 14.0 inches from this storm. 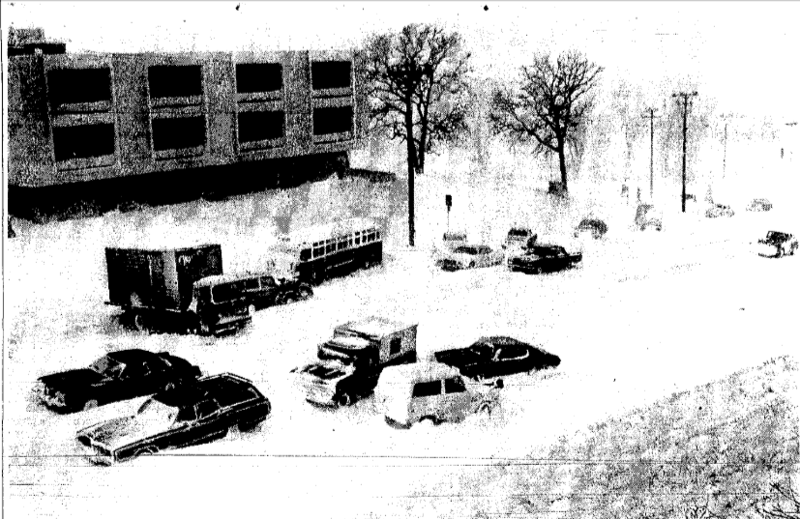 In 1973, possibly the worst April blizzard on record in Iowa pounded the state from April 8-10. Snowfall totals of 20.3 inches at Belle Plaine and 19.2 inches at Dubuque set all-time storm total records at those locations. Total amounts of 16.0 inches were reported at Lansing and New Hampton, while Cedar Rapids received 14.5 inches, Iowa City 14.3 inches, and Des Moines 14.0 inches. At Des Moines 10.3 inches of their total fell just on the 9th, making it the snowiest April day on record at that location. Winds gusting to 65 mph or higher resulted in near zero visibility and blew the snow into drifts as deep as 16 feet closing most roads in the state. 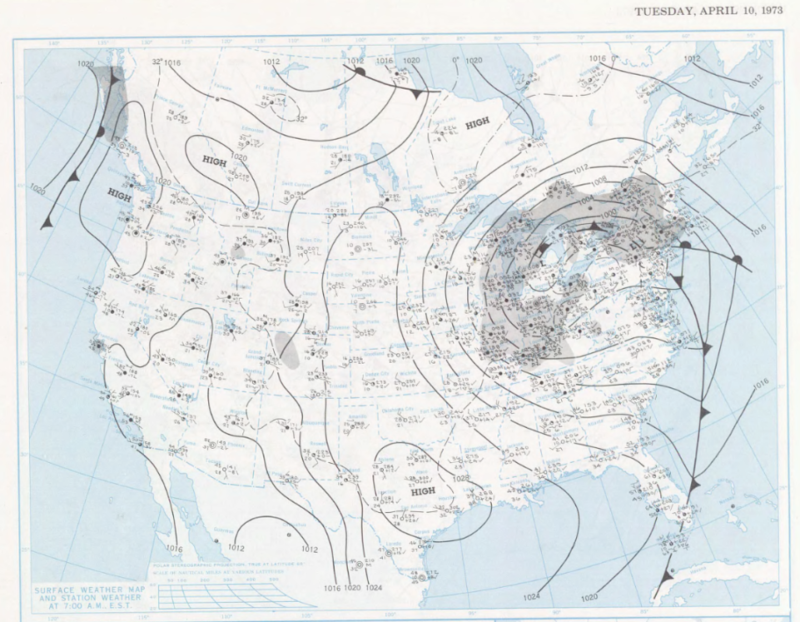 Surface map on the morning of April 9, 1973 shows the strong low pressure center over southeast Iowa and northern Illinois. Much of Iowa was receiving strong winds and blowing snow at this time. Tuesday morning April 10, 1973, the blizzard was winding down across the state. Bell Avenue and Fleur Drive on April 9, 1973. Image courtesy of Des Moines Register. April 1973 Blizzard aftermath. Unknown location. 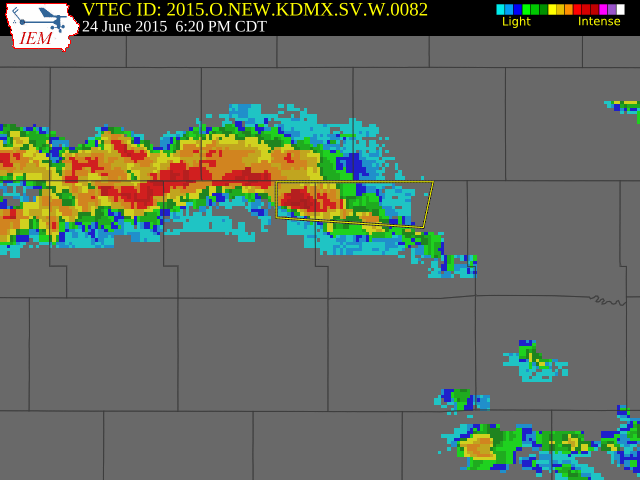 Two periods of storms affected central Iowa during a 24-hour period from June 24 to June 25, 2015. The first round of storms occurred during the morning hours on June 24 that affected portions of Iowa along and south of Highway 20. This was the “primer” for significant flash flooding and river flooding that would result from the second round of storms to affect the same area later that evening. The second round of thunderstorms began to develop over west-central Iowa late in the afternoon and quickly became severe by the early evening. The first Severe Thunderstorm Warning (Figure 1) issued by the National Weather Service in Des Moines was at 6:20 p.m. CDT on June 24 for Guthrie and Dallas Counties. 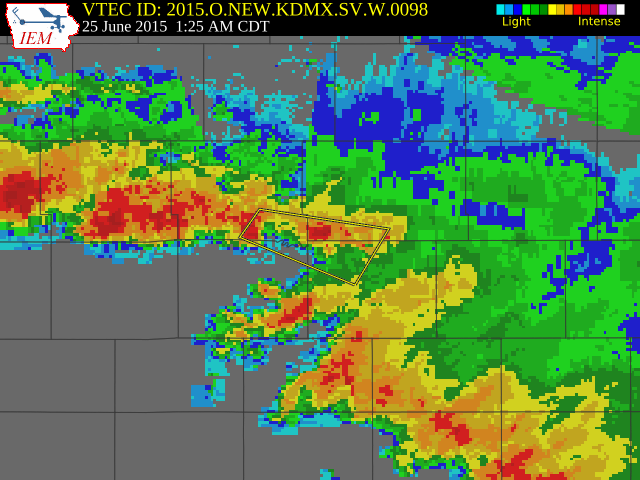 The final Severe Thunderstorm Warning (Figure 2) expired at 1:50 a.m. CDT on June 25 for Marion and Jasper Counties. There were multiple reports of large hail that ranged from the size of a quarter (one inch) to hen egg (two inches) throughout the night. Winds to 60 mph caused numerous trees to become damaged and there was even a report of an 80 mph wind gust in Guthrie County early in the evening. Extremely heavy rain brought widespread flash flooding from west-central Iowa to southeast Iowa, including the Des Moines Metro, late in the evening into the overnight hours Thursday morning. The video below shows the entire second round of storms unfold on radar from the first development of a thunderstorm around 6 p.m. CDT on June 24 to the final drop ending around 2 a.m. CDT on June 25. Widespread rainfall amounts of three to seven inches were reported after the event, with the highest report of 7.25” near Dawson, Iowa in northwest Dallas County. From Bagley to Jamaica, Iowa, radar estimated near nine inches of rain fell within this area of the upper reaches of the Raccoon River Basin. The majority of the heaviest rain fell within the Raccoon River Basin (Figure 3). As a result, major to near record flooding occurred along the Raccoon and Des Moines River Basins, including several tributaries (Figure 4). In fact, the Walnut Creek recorded its highest crest ever at two river gauge locations. The Clive I-80/35 (CLVI4) and Des Moines 63rd Street (DOSI4) gauges crested at 13.41 feet and 18.82 feet respectively, both breaking the previous records set back on August 9, 2010. Near record flooding occurred on portions of the Raccoon River, with Van Meter (VNMI4), Des Moines Highway 28 (DMWI4) (Figure 5), and Des Moine Fleur Drive (DEMI4) all cresting at their third highest crest in history. 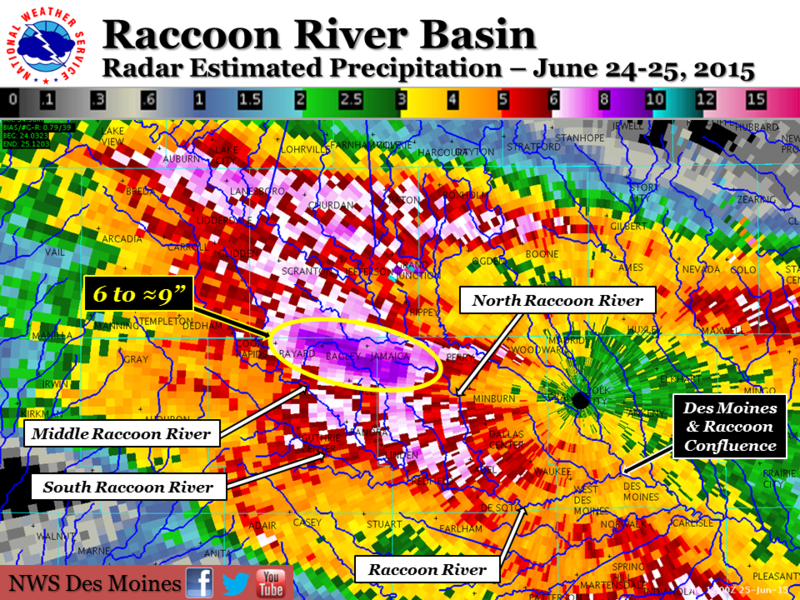 All the flooding on the Des Moines and Raccoon subsided by June 29, 2015. Figure 3: Storm total radar estimated precipitation ending 7 am June 25, 2015. The yellow oval received 6-9 inches of rainfall in the headwaters of the Raccoon River Basin. 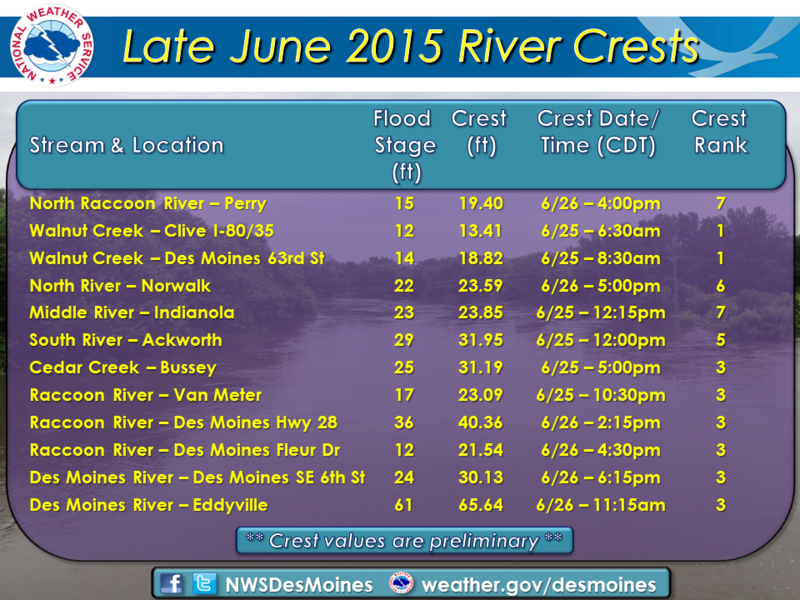 Figure 4: June 2015 crests along central Iowa Rivers. 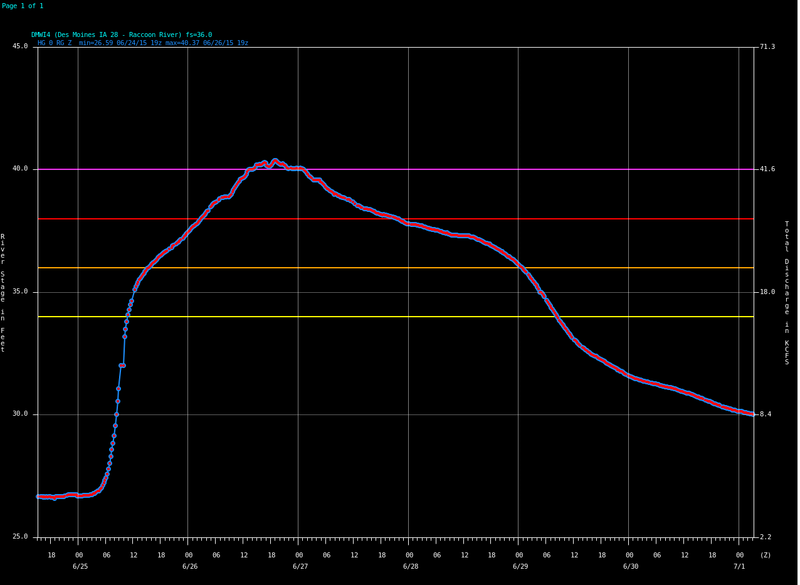 Figure 5: Hydrograph of the Raccoon River at Des Moines Highway 28 shows it crested just above major flood stage (purple horizontal line) on June 26, 2015. 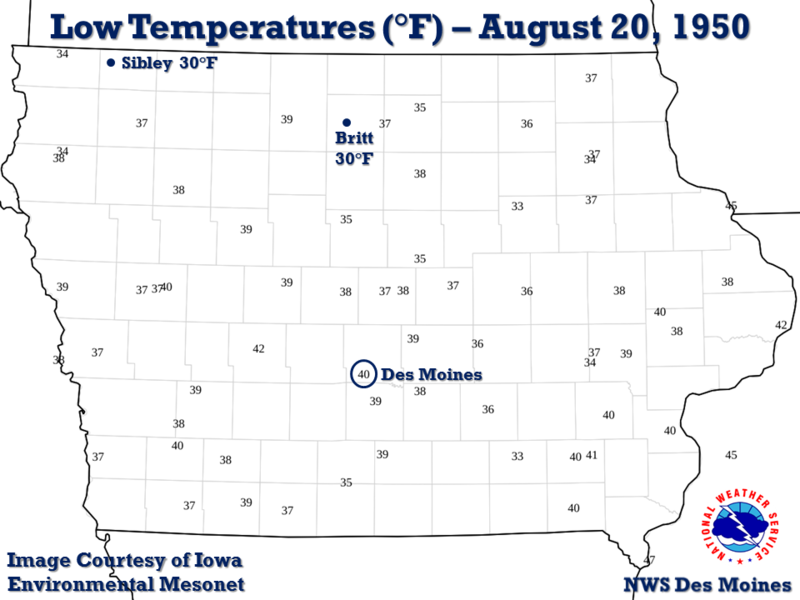 On August 20, 1950, unseasonably cool weather sent the temperature plummeting down to 30°F at Britt and Sibley, Iowa. This tied the all-time coldest August temperature for Iowa, which previously occurred a full ten days later on the 30th (Elkader in 1893 and Mason City in 1915). At Des Moines the temperature reached 40°F on the 20th, tying the August record at that location. Other low temperatures around Iowa that morning included 31°F at Decorah, 32°F at Clarion and Saratoga, and 33°F at Atlantic, Inwood, Sheldon, and Waterloo. The majority of Iowa was 20 to 25 degrees below normal with respect to low temperatures. 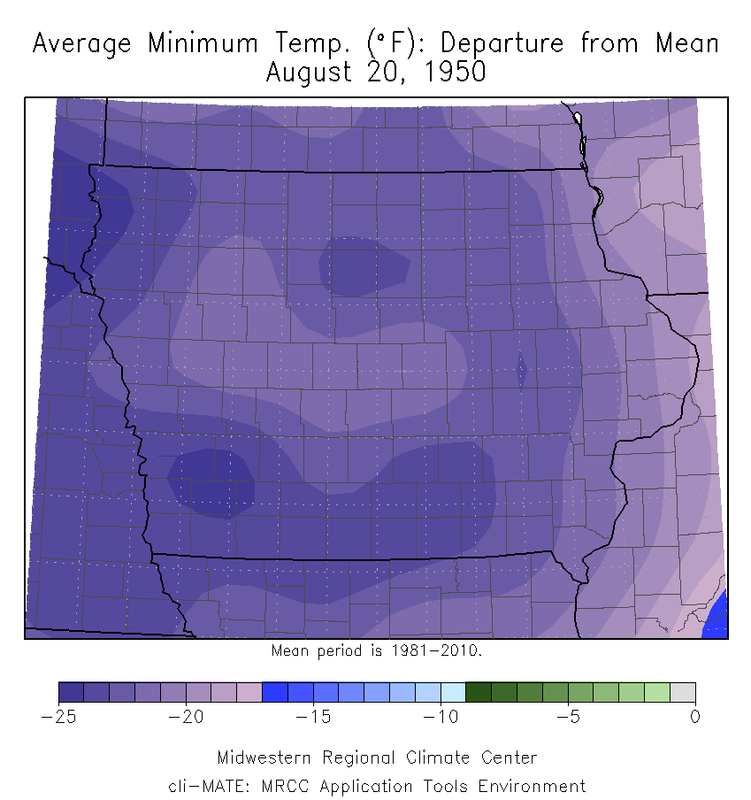 Departure from Normal Minimum Temperatures on August 20, 1950. Low temperatures on the morning of August 20, 1950. Image courtesy of Iowa Environmental Mesonet.